CAD-CAM software developer BobCAD-CAM, Inc. is proud to announce The Manufacturers of The Future Competition, designed for all students in CNC Programming and Machining. – Plus one free full version CAD-CAM software download of student’s choice up to a value of $750 USD. – Plus $500 in cash for travel expenses. – $395 credit for any BobCAD-CAM software or training. ALL ENTRANTS may download free full-version CAD-CAM trial software and are eligible to participate in the hugely discounted Manufacturers of the Future BobCAD-CAM Work Ready Program. This includes the tools & training resources to take with them into their first manufacturing job. This program is designed to give students a fast track to a rewarding career & to stand out from the crowd with BobCAD-CAM. BobCAD-CAM CNC programming software provides a faster, more efficient method of programming toolpath machining operations through Machining Wizards, High Speed Adaptive Cutting and Dynamic Machining Operations™ that allow one to apply multiple roughing and finishing operations to a single CAD feature of a model. These features and many others make BobCAD-CAM a highly popular and widely used CAD-CAM product for any CNC toolkit. Students can Try It Free before they buy with fully functional trial software version HERE. Students can get onto the surest, quickest route to landing the job they want with the latest BobCAD-CAM CNC software products! NOTE: The contest is open to all students. No purchase necessary to enter. 1. 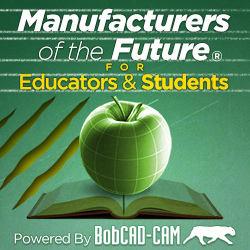 Submit a 1-2 minute video saying who you are, where you are studying and why you should receive our BobCAD “Manufacturers of Tomorrow” Scholarship. 2. Upload this onto YouTube. 3. Include a link back to http://www.BobCAD.com in your YouTube Video Description. 5. Send an email to: [email protected] with a link to your YouTube video. 6. The competition will be judged on the students considered to be most deserving of receiving free software or training to assist them to get started in the workplace. This could include barriers you have had to overcome to get as far as you have. You could show how creative or innovative you are and how the training and software would help you to jump start your career. There is no limit to how creatively you can present your case as deserving of the prizes offered in the competition. 7. Entrants’s YouTube videos may be shared on social media platforms or used for promotional purposes by BobCAD-CAM Inc.
8. Only enrolled students may apply. 9. Employees or family members of BobCAD-CAM Inc. are excluded from being able to compete. 10. No cash alternatives or substitutions to the above prizes available. 11. No purchase necessary to enter.